Kevin Amuneke. Pic by PressEye. Portadown manager Niall Currie has accepted the reality of relegation - but took another step towards next season’s rebuilding work this week by handing a trial to former Nigeria international Kevin Amuneke. 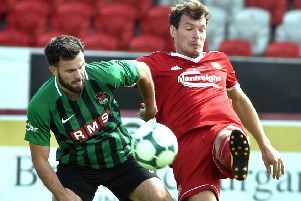 The Ports stand 14 points behind Carrick Rangers with a maximum haul of 15 available over the final five Danske Bank Premiership dates. Currie, however, considers the manner of defeat to Dungannon Swifts last weekend an example of how too many players within the club have “given up” and now views preparations for a Championship future as his priority. An example of that was provided in the midweek friendly against Banbridge Town that featured a string of teenagers from the reserves plus Amuneke, a former international with Nigeria recently departed from Linfield who has club experience in Portugal and Sweden. Amuneke signed a short-term deal with Linfield after attracting attention due to his displays at Ballynure Old Boys. Currie’s pursuit of Amuneke started as Ards manager before a switch to his hometown club last December and the Ports boss considers the versatile attacker a key target. “The Dungannon game was the latest example of how I feel certain players have given up on us avoiding relegation,” said Currie. “Similar to Ballinamallard United away, Ards at home and Carrick away, with certain players looking beyond the club now to futures at other places. “I wanted us to go down fighting but now I’ve no choice but to start really putting plans in place for next season. “Kevin figured for the whole game against Banbridge across a number of positions as we switched formations. “He has not played much of late but is someone I know from my time trying to sign him at Ards and I believe he can give us something extra. “I know my budget for next year and we have some really exciting young players pushing on, as well as signings already confirmed to join.